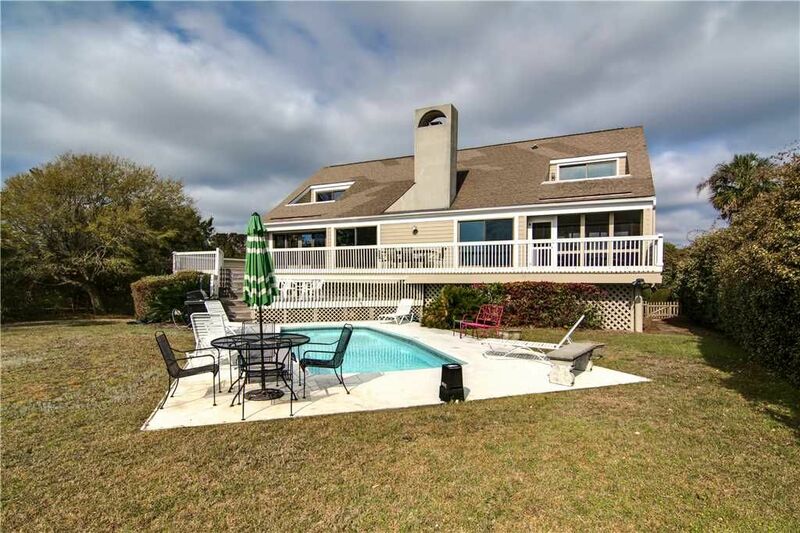 3611 Beachcomber Run is an oceanfront five bedroom, four bath home featuring a private pool and a direct walkway to the beach. The home offers multiple decks, a den with a full bar, screened porch, bonus room with additional bedding for kids, gas grill, 3 car garage, and much more! Additionally, the home is located on the same street as 3609 Beachcomber, which can be rented together through Wyndham Vacation Rentals! 4300 Square Feet. FIRST FLOOR: The living room features a vaulted ceiling, plus deck and porch access, and great ocean views. The den has a flat screen TV, DVD player and VCR, plus full bar, including a mini fridge and sink. The updated eat-in kitchen is equipped with stainless steel appliances (including a separate wine cooler) and granite counters. The dining room table can comfortably seat eight. The living room and den both lead to the spacious wrap-around deck, with steps down to the private pool. This is a great area for outdoor dining or sunbathing. The first floor master suite faces the ocean, and has direct access to the screened porch. This bedroom is furnished with a king bed, plus TV and DVD player. The private bath features a whirlpool tub, separate shower, water closet, and dual vanity. A separate sleeping wing of the home can be closed off to make one large room, and houses two bedrooms and a shared full bath (shower only). One bedroom has a full bed; the other has a queen bed and deck access. SECOND FLOOR: A catwalk balcony overlooks the living area and ocean, leads to the additional bedrooms. An en-suite bedroom on the left features a Queen bed, private bath (shower only), and small, private deck overlooking the ocean and pool. Another bedroom is furnished with a Queen bed, and has a small private deck which faces the ocean. A full hall bath (shower only) is shared by this bedroom and the bonus room. The spacious bonus room has two twin-sized beds, and also offers a wicker sitting area with TV, VCR and DVD player, a bookcase full of books, and a piano. Emma, We're glad to hear you enjoyed your stay. Thank you for taking the time to leave this review, please come back and visit us again soon!